Delivering added value to your clients is the best way to differentiate your firm. That was the conclusion of a survey of over 5,000 buyers of A/E/C services who were asked which criteria they used most often to distinguish between similar firms. "Value for the dollar spent" was the top response. While that survey was conducted a decade ago, there's no evidence that the results would be much different today, is there? If anything, the stagnant economy has increased the number of buyers looking for good value. Yeah, for many, better value means lower fees. But cost alone does not define value. What is value? 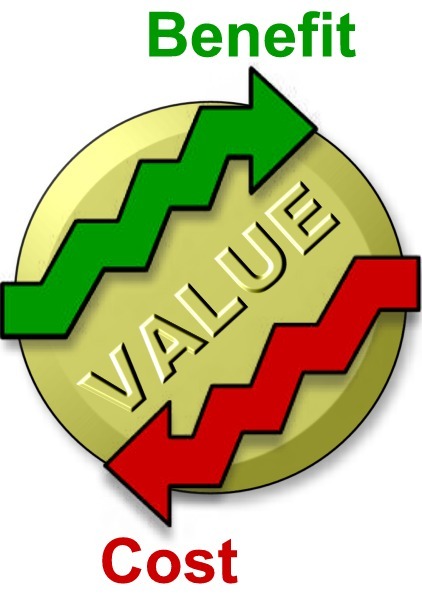 Here's my favorite definition: Value is the perceived benefit received, less the associated cost. Lowering the cost may increase the value of a product or service. But people have always been willing to pay more for greater benefit. If your firm is struggling with increased pricing pressures, you better start focusing on the benefit side of the equation. Don't miss this important point: Value is a personal, subjective calculation. You can't quantify value simply by looking at purchase price, or some other tangible attribute. Value is derived from the "perceived benefit," and people's perceptions of value are widely divergent. For ready evidence of this, check out eBay. A burnt piece of toast that with some imagination bore the image of President Obama commanded $205. That was a steal compared to the $28,000 someone paid for a grilled cheese sandwich that reputedly had the image of the Virgin Mary on it. Among my favorites, custom air guitars selling for upwards of a hundred dollars. One customer posted this question on an internet forum: "I bought an air guitar on eBay for only $42.68. Did I get a good price or what?" "Depends on what model it is," came one response. Another added, "I'll sell you the matching amp for $50." Okay, you get my point: Customers define value. And because value is personal and subjective, it is delivered in both tangible and intangible ways. Don't overlook this! Technical professionals often miss the subtleties of delivering intangible value. What's intangible? Perceptions, feelings, experiences, values. I know, you didn't sign up for this when you decided to become an engineer, architect, or scientist. But if you want to add value to what you do, if you want more success as a business developer, if you want more client loyalty, you can't ignore the experiential product. Professional services are experienced, and clients place as much value on the experience as the expertise. You can't deliver added value by simply providing better technical solutions. Value goes much deeper than the balance sheet or the spreadsheet alone. With this in mind, what then is added value? Quite simply, when the client receives more benefit for the cost (tangible and intangible) than expected. Many firms make empty marketing claims of delivering added value without ever having defined it--or more importantly, without allowing their clients to define it. I know, I've asked for the evidence, both from A/E firms and their clients. So let me challenge you to look deeper into your value proposition. Put it to the test. Ask clients for clarification. Package tangible and intangible benefits in your technical solutions. And maybe throw in an air guitar for extra measure. Who knows, your client might see it as added value.